Early cracks are emerging in the Vancouver pre sale condo market. Vancouver based developer Jago Developments Inc. alerted buyers they would be served with a 15% price increase following substantial delays in the construction process of their New Westminster condo project, the Westbourne. The low rise wood frame condo building featuring a total of 55 units, was initially sold out in 2016 around $475/ square foot with an expected completion date of spring/early 2017. However, per the developer, “Due to numerous factors beyond the developer’s control, including unforeseen soil conditions, labour shortages and extreme weather, among others, there have been significant delays and, as a result, the project has been delayed and the developer will lose a substantial amount of money,” citing “cost overruns in the millions of dollars”. As a result, buyers are being told they’ll be partly responsible to foot the bill. They must agree to a new price that is 15% more, If not, they can choose to terminate their sales contracts and get their down payment returned, plus an additional 50%. They can also opt to get their down payment back, and then wait for the developer to eventually sell the unit to a new buyer and then receive 40% of the difference between that new sale and what they originally paid for the condo on pre-sale, minus taxes, fees and commissions. The debacle comes as a subtle reminder of the risks involved in the pre sale market. 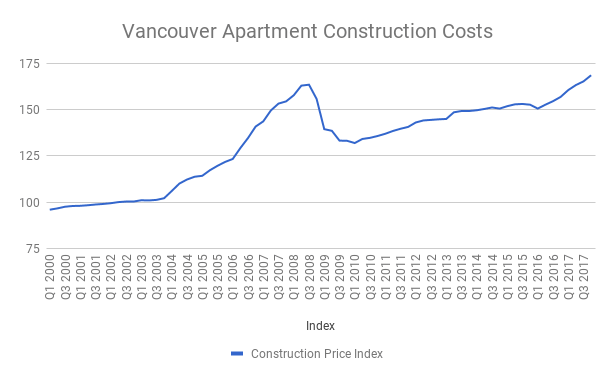 A record 40,000 units under construction in Greater Vancouver have sparked severe labour shortages and pushed construction costs to record highs.